I wish I had a Tractor I am getting too old for this tiller. I tilled my garden today. It has rained almost every day for a month but the 70 and 80 degree weather and 20 to 25 mph wind every day has helped to dry out my soil. I had to mow the garden with the lawn mower before I tilled it. Soil is soft, black and looks very good from the peat moss I put in the garden last year. This tiller wears me out I need to take a 4 hour rest, I guess the exercise helps keep me healthy. I wish I had one of those little Kaboda tractors with a tiller attachment but then I would need a storage building for it, how much $$$$ will all that cost? I am retired spending my time tilling the garden is better than watching TV or being on the computer. Do I really need a tractor for a 30'x40' garden. Weather man says its going to be 82 degrees tomorrow and upper 70s and sunny for a whole week. I hope to get my tomatoes planted soon. No one in town is selling tomatoes yet it frosted here Friday night and last frost is usually about April 15. Does anyone have a little tractor? Have you checked craigslist? I looked at Chattanooga craigslist just to get a feel for what's out there. A lot of what they call tractors, just look like riding lawn mowers. This is a small Kubota "tractor" mower, doesn't say anything about tiller attachment. Could one be put on it? This is a 1984 Kubota that looks more like an actual tractor, has space for attachments. Looks like diesel engine. They are asking $3000 for it, so that gives you an idea of the kind of money you might be looking at. We must be about the same age. We wear out a little faster every year it seems. 30'X40' is too small for a tractor. I like the idea of tilling over a couple or three days. I usually get in better shape in the spring, so just count it as good exercise. The hit the couch with a cold one of your choice. Instead of looking at a tractor, why not look into getting a nice TroyBilt larger tiller that is self-propelled and be done with it. I had an 8 hp. Horse before Hurricane Katrina took it after it sat in brackish water for over 2 weeks and I didn't have the time to fool with it since I was busy getting my house back in shape to move back in. That tiller was easy to work my similar sized garden and made short work of tilling the soil. It had 2 forward and 1 reverse speed and was a counter rotating tine tiller that chewed up the soil in short order. Now I have a little 5 hp. Sears tiller that works fine, but is not near as easy to work as the old Horse was, but it still beats digging my garden by hand. I have an old Troy Bilt Horse. This thing has been excellent. I tilled the garden again today it was easier this time. 2/3 of the way into the job the tiller fell apart I had to get wrenches to put the drive pulley back on the motor. After setting all winter the soil got hard. We moved into this house last years this land was farm land 40 years ago soil is very nice but the tree roots are a nightmare. There was a tree stump in the garden last year I hand dug a 10 foot diameter hole and chopped out the stump and large roots with an ax. There are still old roots and new root every time the tiller snags a root it jerks the tiller so hard it just about jerks my wrist, elbow and shoulder out of socket. Maybe someone with a big tractor could plow right through all these roots. 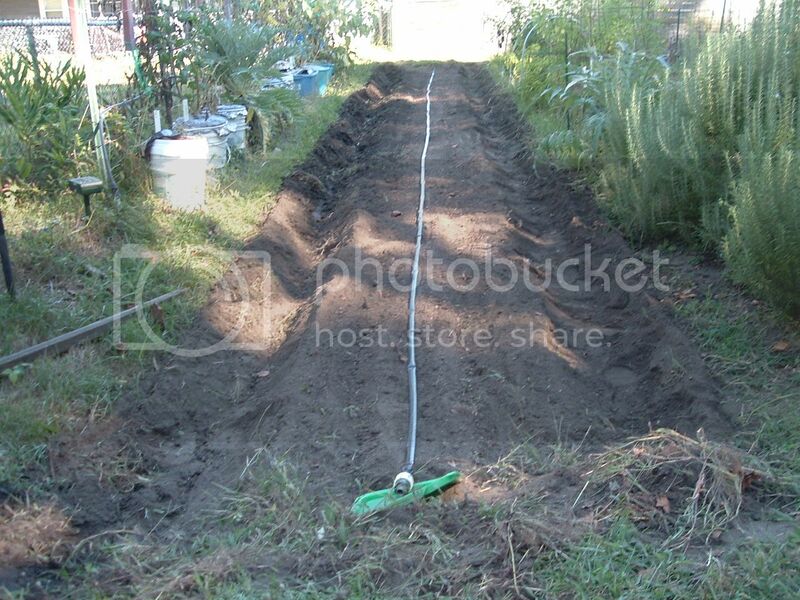 Last years the garden was only tilled 2" deep is several places this year most of the garden is tilled 4" deep, I would like to have it tilled deeper. If the wind would stop blowing 20 mph for about 1 hour I could put peat moss on the garden and till it in. I need to till the garden 12 more times in 12 days to kill all plant life and make all the seeds germinate and die then the garden will be ready to plant and I will have no weeds or grass to hoe or till until about October. I have a 5 hp tiller I bought new last summer. I don't have a good lay out for the plants yet tomatoes are going to be planted so they get full shade after lunch and corn and melons get full sun all day. The angle of the sun is still low enough that 1/4 of the garden is still full shade all the time. tilling 12 times in 12 days just seems like beating your soil to death. No wonder you are always writing about how many tons of organics you have to add. Weed seeds don't sprout that fast. You could till three times in 2 weeks (till, wait a week, till, wait a week, till) and accomplish exactly the same thing. Or you can go no-till with lots of mulch. rainbowgardener wrote: tilling 12 times in 12 days just seems like beating your soil to death. No wonder you are always writing about how many tons of organics you have to add. Weed seeds don't sprout that fast. You could till three times in 2 weeks (till, wait a week, till, wait a week, till) and accomplish exactly the same thing. The hardest thing to get rid of are the clumps of grass. Sometimes I crawl through the garden on my hands and knees to toss out the grass blobs. The garden was 1/2 this size last June then I expanded it 10 feet to the south and 10 ft to the west there is no peat moss in that part of the garden so I need 2 bags of peat for that area. That is probably all the peat moss I need this year soil is looking very good today. I probably only need to till about 5 more times just have to wait and see. It is a very fast till only takes about 10 minutes zoom through the whole garden just enough to stir the soil and kill the plants that were tilled in and bring more grass blobs to the surface. 6 tomato plants, 2 bell pepper plants and 3 Rhubarb plants are all I am planting until soil warms up about 2 or 3 more weeks. My son lives in an apartment he will probably come over with a dozen tomato plants, he likes to experiment with plants that he reads about online, the cherry tomatoes he planted last year surprised me how well they did. This reminds me, I wish I had a tiller, I'm getting too old for this spading fork! Taiji wrote: This reminds me, I wish I had a tiller, I'm getting too old for this spading fork! I picked up the one I now use off of Craigslist several years ago for all of $150. It is a small front tine 5hp tiller made by Sears, but it does do the job much easier than hand digging my garden space, and well worth the little money I spent for it. I still hand turn the 3 areas under my trellises, but I'd not want to turn my whole garden by hand. This tiller is a far cry from the self-propelled TroyBilt Horse with the 8hp engine my other tiller had that I picked up for $400 a couple years before Hurricane Katrina got it, but is sure beats the alternative. Here is my tractor and tiller. Yes, you can get some good machines, however you need to look at price and ask, why do I really need a tiller? The older Cub Cadets & John Deere's are great garden tractors. Mine's a 1975 Model 1450 with hydraulic lift.. I cut most of the roots out of the garden with an ax today and tilled soil 4" deep, it is ready to plant before the rains come tomorrow evening. I am looking to buy a tiller. Which tiller is right for me?